Death is a band that has oft been aped but rarely properly imitated. The band who perhaps got closest in recent years was of course Gruesome. However Cist have recently thrown their collective hats into the ring. 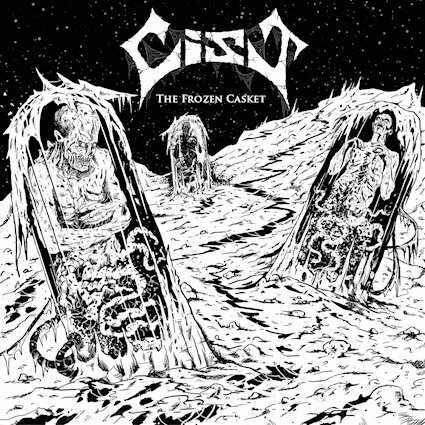 With a vocalist eerily reminiscent of Chuck and a songwriting guidebook stolen straight out of the bands legendary Leprosy era there is something undeniably fun about the thrash metal inspired death metal assault of Cist. This is the sort of crazy and over the top OSDM that makes me smile, it's not obsessed with brutality but rather sheer songwriting magic. The Frozen Casket has rapidly gotten me completely obsessed. There is a sense of true heaviness that makes it exciting and the chainsaw guitar riffs possess the same magic that made old school Death so thrilling. This is a band who are attacking a side of the genre we don't get to see as much of in an era where Gatecreeper dominates the scene. With spiraling riffs darting all across the fretboard and dance-able jams creeping into your skull with every passing second it's hard not to be in love with Cist. This is the sort of group who not only have captured a moment in time, but they do it justice in a way that is loving and exciting. Cist are more than just Death clones, they are bringing potent elements to the genre. While there certainly are missteps (I'm looking at you spoken word bridge on Mitosis simulation) this is a thrilling effort from a band who clearly get what the genre is about. They are bringing a punchy assault to the fore with every passing moment and it's hard not to fall in love with the guitar assault. Memorable, thrilling and able to take you right back to the magical year of 1988, Cist are here to melt your face.